In what is becoming a busy offseason for them, the Los Angeles Angels have made another notable signing. 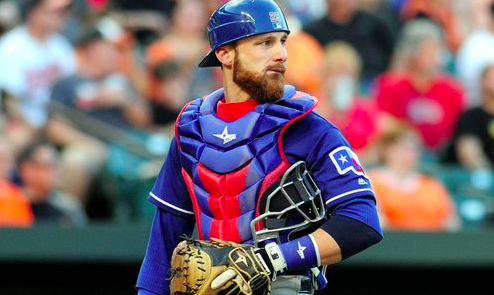 Friday night, the Halos agreed to terms with free agent catcher Jonathan Lucroy. The deal is for one year and $3.35 million. However, Lucroy can earn up to $4.525 million with incentives. The signing will help the Angels fill one of their biggest holes this offseason, presumably in a cost-effective way. Not long ago, Lucroy was regarded as one of the best two-way catchers in all of baseball. He was an all-star in both 2014 and 2016 and posted an OPS over .800 three times between 2012 and 2016. However, Lucroy has seen his offensive numbers plummet the past couple of seasons. This past season with the Oakland A’s, Lucroy hit .241 with an OPS of just .617. Nevertheless, the 32-year old backstop still brings plenty of value. He was one of the best catchers in the American League last season when it came to throwing out opposing base stealers. He also has a good reputation for working with pitching staffs. There’s no doubt he had a significant impact on Oakland’s young pitching staff last season, helping the A’s to defy expectations and earn a wild-card spot. Perhaps most importantly, Lucroy helps the Angels fill a big hole on their current roster. Los Angeles got by last season with Martin Maldonado as their primary catcher. Maldonado, who is now an unsigned free agent, did provide the Angels with a strong defensive presence behind the plate. However, he doesn’t have the offensive upside that Lucroy brings to the table. With Lucroy, the Angels are hoping to get an impact from their catcher on both sides of the ball in 2019. With Lucroy in place, the Angels are likely out of the running for free agent Yasmani Grandal or trade bait J.T. Realmuto. It appears Lucroy will head to spring training as the team’s primary catcher. Journeyman Kevan Smith and youngster Jose Briceno will compete during spring training for the backup job. However, that doesn’t give the Angels a lot of organizational depth behind Lucroy, so another low-key addition could be possible. The addition of Lucroy gives the Angels another modest, cost-efficient signing this winter aimed at making them at least marginally better. The Halos have also added Matt Harvey and Trevor Cahill to their starting rotation while also signing slugger Justin Bour. On their own, none of those signings moves the needle all that much. However, the addition of several proven big leaguers does improve an Angels team that does have a solid core in place led, of course, by Mike Trout. Lucroy specifically, is a solid pickup for the Angels. Even if he can’t regain the offensive production he once had, he’s still an asset behind the plate. Without having to spend a lot, the Halos have addressed their need for a catcher. The addition of Lucroy should make them better in 2019.